Etainia relaunched both the Member’s private website and the public real estate marketing website with refreshed looks, technology and strategy. 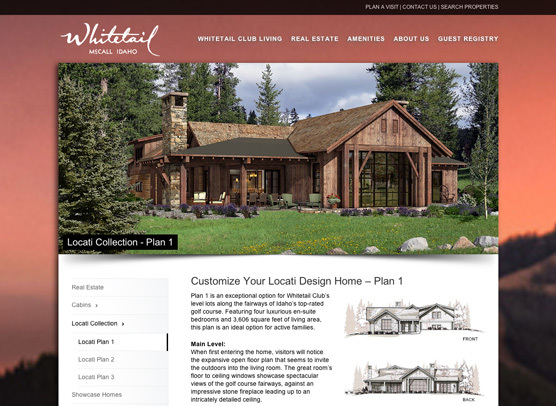 A responsive WordPress based site was designed to showcase the beauty, lifestyle amenities and features of Whitetail and the surrounding McCall area. As a four-season resort, Whitetail has activities and programming year round for their members whether they reside in Whitetail full time, seasonally or if they are non-resident members. The Member’s website features event calendars, a members directory, event galleries and all the pertinent information club members may need, even the current weather! The public site is designed to feature their showcase properties, cabins, homesites and the many amenities available to residents.